Two Deluxe Master Suites Plus a Theatre Room! Welcome to Moose Hollow MH801! Enjoy all that the Wasatch Mountains have to offer in this beautiful two bedroom condo! This property is truely unique with its suite style bedrooms with private bathrooms, large entertainment room, sitting room, and spacious kitchen, you can enjoy time with friends or relax on your own. Just steps away from some of the best outdoor recreation in Utah, you are sure to make lasting memories in MH801! Main Level: Kitchen, living room with TV, half bathroom, balcony, and bedroom with ensuite full bathroom. Upstairs: Bedroom with ensuite bathroom, laundry room, and entertainment/TV room with 60" TV. Bedroom 1: 1 Queen suite bedroom with full ensuite bathroom. Bedroom 2: 1 King suite bedroom with ensuite bathroom. 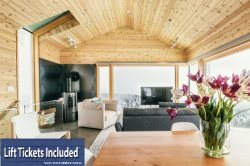 We are truly excited and honored to share our homes with each and every guest and we invite you to stay with us at Powder Mountain Getaways - MH801!